At Happy Hauler, we're in the full swing of spring cleaning season and that means hauling around a lot of old, heavy, worn-out appliances. While we're happy to take your old refrigerators and washer/dryers off to the big scrap heap in the sky, taking a creative approach to your junk removal or decluttering effort this spring can save you (and our backs) the pain of hauling off an old refrigerator this year. Check out these amazing uses for old and decrepit refrigerators and don't forget, if you've got a pile of stuff you can't seem to find the bottom of, call us today and we'll take care of it for you! If the seal on your fridge is still intact, you can use it for food and non-food storage alike. Stripping out the old parts and mechanical elements of your fridge and utilizing a little elbow grease can create a dry food pantry with shelving, a root cellar, and even a gun cabinet or safe! 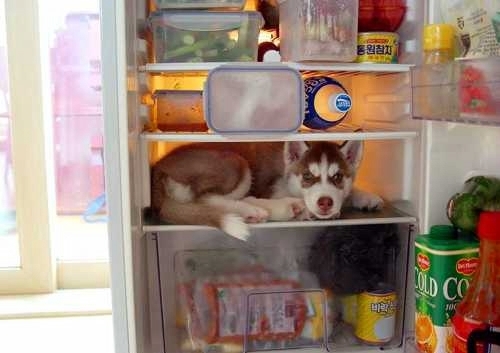 Flip that old fridge on its side and lay down some cushions to create a safe, snuggly bed for your furry companions. Sure, you'll want to refinish the exterior and add some pet-friendly features like walking ramps and a watering system, but the insulation and security they'll feel in a durable enclosure will make for happy pets all year long. Repurposing your old cooling unit for another similar line of work is a great, cost-effective solution for outdoor cooking and gatherings. Removing all cooling accessories and parts from the refrigerator leaves a nice, clean, solid environment that's perfect for keeping drinks and food cold throughout the summer heat. Plus, with a little extra craftsmanship, you can completely disguise your old fridge and blend your "new" icebox with the rest of your outdoor decor. Kraft Karina has a great guide on building a DIY ice chest from the remains of an old refrigerator and the results are amazing. If you're at the end of your wits with your old fridge and want to see it gone for good, you can trust the team at Happy Hauler to remove and recycle your old refrigerator in an eco-friendly, responsible manner. Learn more about our approach or contact us today to schedule a pick-up. Hurry! Spring cleaning season is fast approaching!